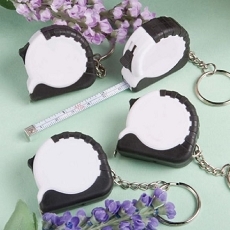 We invite you to take measures to make your wedding, shower or any other event truly your own with these useful measuring tapes as your one-of-a-kind favors. 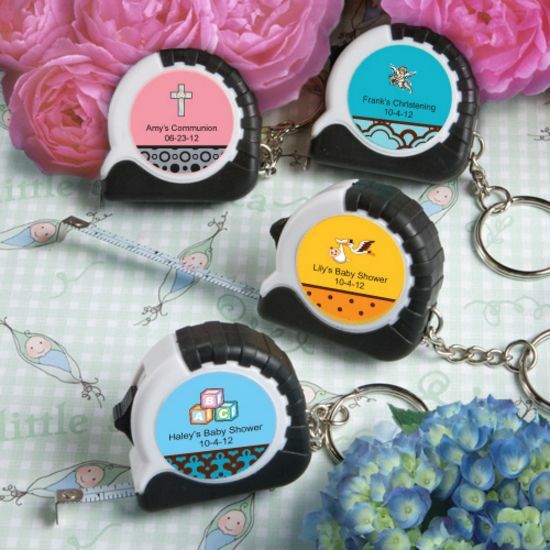 Each Personalized Expression Collection keychain/measuring tape favor from Fashioncraft, measures 1.5" x 1.5" and has an outer case made of hard white plastic with easy-to-grip black sides and a retractable metal measuring tape inside that expands up to 100 cm or 39.25" with a black tab to hold your measurement, attached to a silver metal chain and key ring. The case's outer center is fit for easy application of the personalized label of your choice. From assorted color combinations, to seasonal and themed designs, to your own title, you design the eye catching label that suits your style! Each comes bulk packaged in a poly bag, along with self sticking label sheets for you to apply. Please allow 3-4 days for production.